Tag Archive | "El Salvador"
Ecuador wills do not work if challenged. We’ll look at some important information about Ecuador wills and Ecuador’s legal system in a moment. Plus see below how asset protection benefits in the LLC you use may have changed. 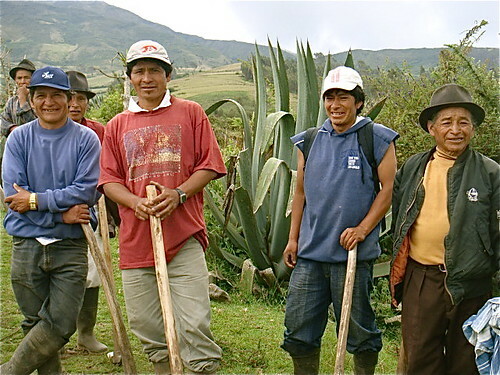 Here is a group of indigenous farmers that our foundation Land of the Sun (LOTS) is helping. They created a mingo (working circle) to clean out their water system that feeds a school that LOTS is helping to renovate. Merri and I and some friends visited to check on their progress. But everyone gets involved in helping. Here is our hotel manager Franklin Sandoval conferring with the head of the village. I mentioned our foundation here because it helps us gained fulfillment in our business, plus creates tax and asset protection benefits plus is part of our estate planning to make sure that the people of Ecuador are helped even after we pass. Making sure that your assets held abroad are protected and properly conveyed in your estate requires extra planning. 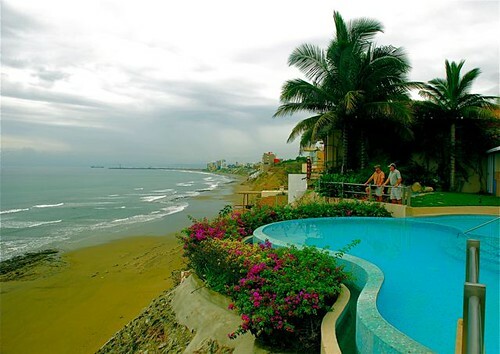 Yet many Ecuador Living subscribers have been buying real estate or are moving to Ecuador without giving thought to the added complexity in their estate plans and other legal requirements. 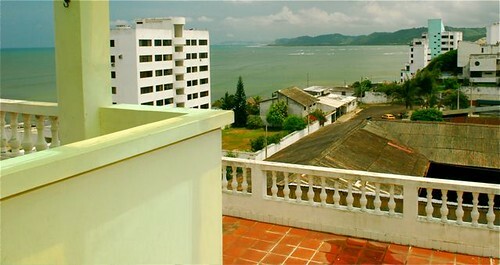 I strongly suggest that you review you entire estate with both a local and Ecuadorian attorney. 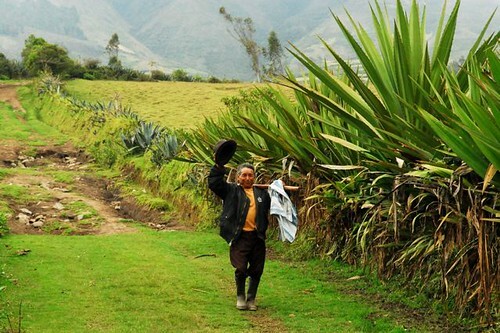 Here are some excerpts from an Ecuador Living report on why. The Western world operates on two systems of law, the civil law of ancient Rome, and the common law of England. These two systems have a lot in common, yet in many important areas they differ. These differences can create legal conflicts in contracts, wills, trusts, parental rights and even residency. The passing of wealth to heirs for example is one area that differs. Few people coming from North America (which operates under a British common Law system), understand that US, Canadian or Ecuador wills do not work in Ecuador if challenged. Many legal systems have evolved from The Roman civil code. The Napoleonic Code is the French version, established under Napoléon I in 1804. The Napoleonic code was not the first legal code to be established in a European country with a civil legal system though. The Codex Maximilianeus bavaricus civilis was reated in Bavaria arund 1756). The Allgemeines Landrecht formed in Prussia, around 1794. The West Galician Code, began in part of Austria around 1797. Many of the civil codes in Latin America are based on an original work derived from the French code and Castillan law. Chile was the first to accept this type of legal system in 1855. Ecuador followed in 1858. El Salvador, Venezuela, Nicaragua, Honduras, Colombia and Panama are other countries with a legal system based on this foundation. 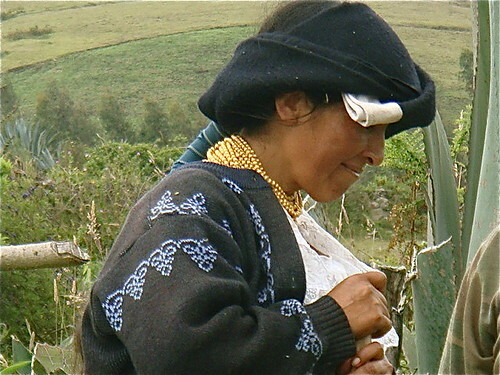 In this Ecuador legal system, the will is called the testament and allows the testor to direct the disposal, in whole or in part, of their property, upon death. The testor retains the right to revoke the provisions in the testament anytime during his or her life. However there is a difference in common and civil law as to what is a person’s property is. In most civil codes, the wife automatically owns half of all property unless otherwise stipulated in a formal way. The children own the other half. Period. A will cannot supersede this fact. If a person’s will leaves all of his or her property to his or her spouse, the will works fine UNLESS the children contest the will. If they do the testament will not be valid. This can create complications in simple circumstances. If the circumstances become complicated… for example children from two or more marriages… then problems could mount. There is even a concern in my mind that a surviving spouse could lose investor residency status if the inheritance falls below required minimums. A spouse could lose residency and a house! In a common law country a person can write a will on a scrap of paper, throw it in a drawer (not advised) and that may be enough. Though it also might not. In a civil code jurisdiction such a will definitely will not work! So if you create a will in Ecuador and then write another later… be sure to make the change official. Otherwise the new will may not work. In a common law legal system wills do not have to be recorded and often the act of writing a new will allows the new document to supersede the old. Ecuador’s Act reforming the Civil Code, of August 17, 1989 updated a number of areas relating to covers relationships between a children and their parents, marriage, divorce, the status of wives, marital property and marital agreements. Having an attorney to help you with estate planning in every country where you hold property makes sense… especially if two of the countries have different legal systems. The US attorney we use is our friend (and trustee of LOTS) Joe Cox. Joe’s firms specializes in cross border tax and estate planning, asset protection and real estate. He provides an incredible system called The Strategic Snapshot which is an easy to use, color coded visualization of a person’s structures, corporate entities, estate plan and assets. We use the snap shot and have found it incredibly useful in seeing how everything from a legal point of view should fit. You can ask Joe about the Strategic Snapshot at jcox@coxnici.com. Joe’s law firm also provides an excellent estate planning newsletter that I read regularly. Many individuals concerned with asset protection have formed a Limited Liability Company (“LLC”) in an effort to protect their assets. In fact, most people do not know that Florida was the second state in the United States to draft LLC legislation (dating back to 1982). Most LLCs we see in our daily practice have been formed as member-managed LLCs, that is, when the members (i.e., owners) of the LLC control and manage the LLC as well. However, due to recent changes in the law regarding LLCs, we are now recommending that any Member-Managed LLC be converted into a Manager-Managed LLC format. The intent of this recommendation is to increase the creditor protection of the LLC should the Member be involved in a lawsuit. For example; under a Member-Managed LLC, if a creditor of the Member is able to obtain the LLC membership units (by court order, for example), the creditor could obtain management rights and make decisions for the LLC. At least one recent court ruling (from Colorado) makes this result a possibility. However, under a Manager-Managed LLC format, the Manager retains control of the management of the assets held by the LLC even if someone else “controlled” the LLC membership units. In a Manager-Managed LLC, an elected Manager (pursuant to the Operating Agreement) manages the LLC. Note, that an existing member can act as the initial Manager of the LLC, and an independent Manager can be elected at a later time, if desired. Under a Manager-Managed LLC format, if a member was successfully sued, and the creditor obtained the member’s LLC membership units, the Manager could withhold distributions from all Members and the creditor would receive nothing. This result could deter a potential creditor from filing an unjustified or otherwise frivolous claim. Plus Joe’s website offers an easy to use internet questionaire. See Questionaire. We live in a complicated world often made more frustrating by the legal system. Legal systems are problematic enough when one lives and resides in one country. Difficulties can compound when living and or holding assets in two countries or more… especially if both legal systems…common and civil become involved. So get an attorney and get advice so you, your spouse and your heirs never find your results uncivil. The text above is an excerpt from a more complete report sent to Ecuador Living subscribers that describes Ecuador legal system, how to create wills there and provides legal contacts in the US, Canada and Ecuador that can help. 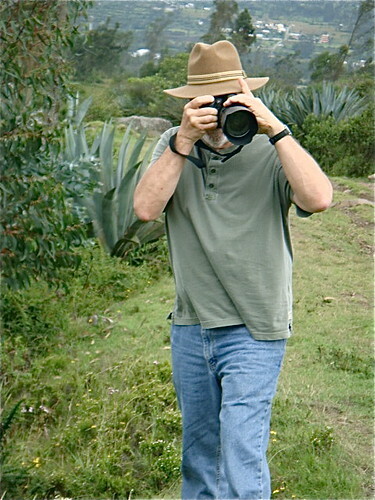 Join us in Ecuador at a 2009 course or tour. Take Two for One. Attend any of the three international business & investing courses below and select any one of the tours above free. See our full 2009 schedule here. Multi currency bank safety has become a big concern in these troubled times. Trust has been eradicated from the system which leaves investors wondering more about risk. Today is my 62nd birthday and I would like to thank you for sharing the day with me. I will do almost anything to learn ways to help you. Here’s proof of the pudding. This may look like I slipped and fell in the mud. 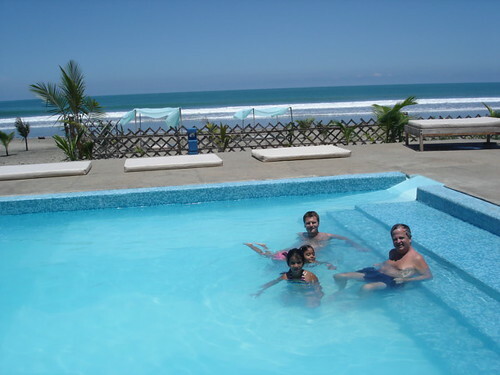 Actually I was trying out a little known volcanic pool near our home on Ecuador’s Pacific coast. The clay is said to purify and heal. 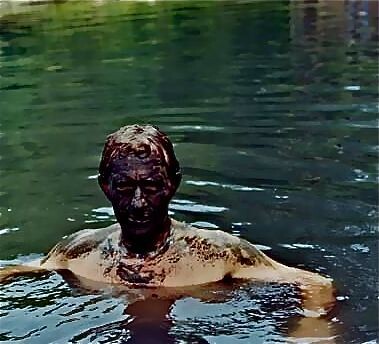 Here I am in that pool with the natives! Imagine this. I can now collect Social Security. I will, but this decision has nothing to do with retirement. See why and how my decision can help your wealth at Multi Currency Diversification. Merri’s and my health, energy and vitality are good. We love what we do. Why not keep on going especially in these fun filled, challenging times of incredible opportunity? But to take advantage of the opportunity we have to be sure we are not wiped out in the current volatility. So let’s look at bank safety and since we share so much about Ecuador at this site, let’s look at Ecuador’s banks first. Then we let’s look at the five safest banking countries in the world. No bank can have a better credit rating than the country it is in! Instead of looking at banks, Ecuador as a nation has a B3 Moody’s rating, CCC Fitch rating and B- from Standard & Poor’s. These ratings are somewhere between “highly speculative” and “substantial risk.” No matter how you cut it…the credit agencies are all saying “do not leave a lot of money laying around in Ecuador”. We just finished a lesson on what all the credit ratings mean in our multi currency course. This is probably not an issue for most multi currency investors because they cannot even have an Ecuador bank account. 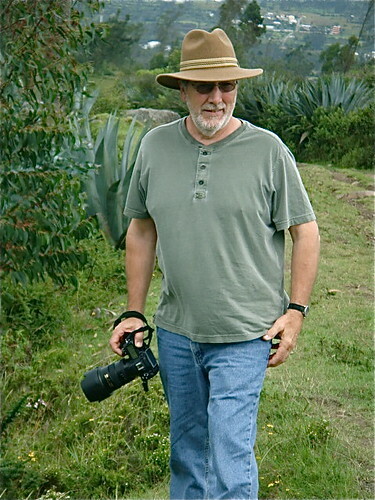 We continually research to get answers to questions from our Ecuador Living subscribers. One subscriber recently asked if non residents can open Ecuadorian bank accounts. Here is a reply from our attorney. 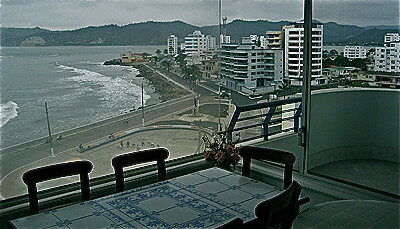 If you have questions about Ecuador subscribe to Ecuador Living. We do our best to answer them. 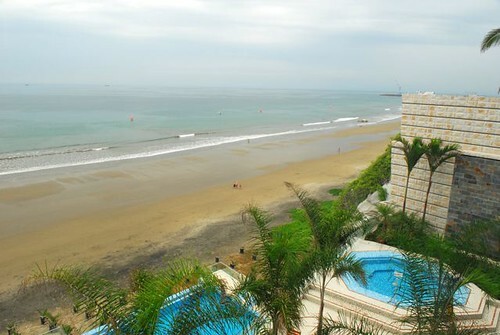 Since Merri and I live the most in Ecuador and the US, we do most of our banking elsewhere. We use our ATM card to live on when in Ecuador. 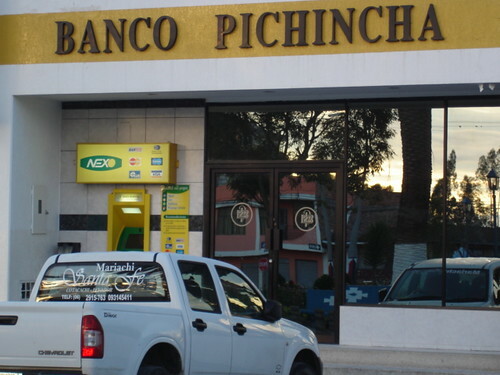 Our bank in Cotacachi is here. So where should a multi currency investor do the majority of his or her banking? Multi currency investors do not want to hold a good multi currency basket of investments in a bad bank…or even worse in a country where banks are unsafe. A recent message Economic Safety in Troubled Times showed one way to gain US dollar bank safety in North Dakota. There is even more safety a bit further north. Canada it appears may be one of the safest places to bank. 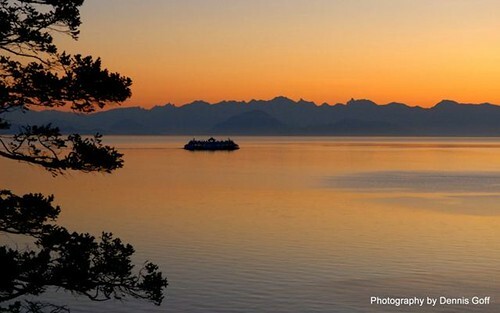 Canada has many wonderful sites and scenes such as this British Columbia shot taken by our friend Dennis Goff. I am really glad to see this and explain why in a moment. First, let’s review Canada and bank safety. Canada has great bank safety according to a Yahoo Canada article entitled “Canada rated world’s soundest bank system” by Rob Taylor says: Canada has the world’s soundest banking system, closely followed by Sweden, Luxembourg and Australia, a survey by the World Economic Forum has found as financial crisis and bank failures shake world markets. But Britain, which once ranked in the top five, has slipped to 44th place behind El Salvador and Peru, after a 50 billion pound ($86.5 billion) pledge this week by the government to bolster bank balance sheets. The United States, where some of Wall Street’s biggest financial names have collapsed in recent weeks, rated only 40, just behind Germany at 39, and smaller states such as Barbados, Estonia and even Namibia, in southern Africa. Singapore was 13th and Switzerland 16th. The current economic correction has reduced bank safety but there is another reason to be a multi currency investor. The current bailout will create inflation and currency corrections…including further weakening of the US dollar. Multi Currency Option #1: Earn more. Multi Currency Option #2: Hold assets in other currencies. 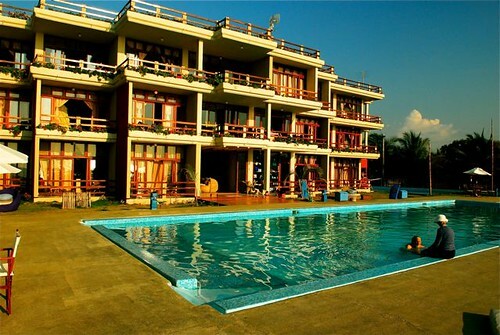 Multi Currency Option#3: Live where life is good but costs are low. This is why the focus of our three sites have these focuses, #1: to help develop small international businesses; #2: invest in many currencies and #3: live in Ecuador. Our fourth focus is on natural health. 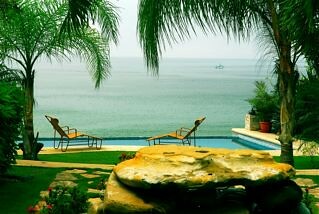 We enjoy Ecuador because life is good there. Prices are low and there are many natural health benefits. However there are some risk…not in banking, not from Ecuador’s government and not from crime or civial unrest. The most realistic risk is from lack of experience in a new found place. Earlier in this message I mentioned Dennis Goff’s new blog at www.e-quator.net. The blog features the Wall & Madison business run by Bob Lofgren and Deborah Nance. Dennis, Bob and Deborah are all long term readers who have become friends with Merri and me over the years. Bob & Deborah were among the first readers to move to the San Miguel gated community. 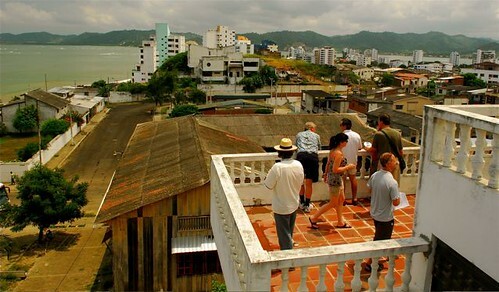 Here is a group of our real estate tour delegates visiting San Miguel. There are some very wonderful homes here. I helped one of my readers sell his recently for $85,000. Here is a typical San Miguel Home. Let me say right here, that I have nothing financially to do with San Miguel in any way. I live nearby and most of the houses and lots in San Miguel are owned by readers. Otherwise I am not involved. Bob & Debroah have started a business to help San Miguel owners because of a problem Deborah described in this note to me. “Gary, As you know, who you trust down here makes all the difference in the world. What should be one of the best experiences of your life can turn out to be a nightmare if you work with the wrong people. There are westerners here who came to Ecuador late in life with no money to make their fortunes before it is too late, and will tell a buyer anything to make the sale. Our attorney has examined contracts from two developers and says they won’t hold up in court. One contract was taken before a judge and pronounced completely useless. Being foreigners, buyers have very little legal recourse if they get hooked by one of these people. Robert and I are not wealthy people, but we have enough money to live comfortably for the rest of our lives. Given the spectacular scenery, clean air and water, abundance of healthy food and sweet people, we certainly feel rich living here. 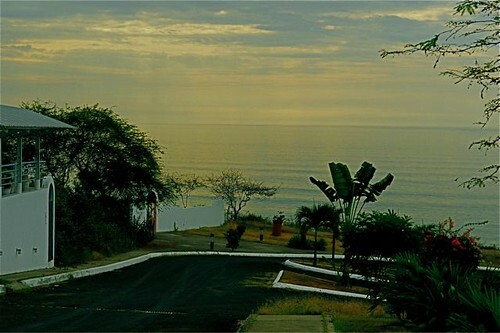 Many people will attest that after talking with Robert and being very excited to buy and build, Robert will tell them there is no land rush, and to go home and think about it and be sure buying in San Miguel is what they really want to do. We care a lot more about our souls than our pocketbooks. We started Wall and Madison, not to make our fortunes, but to be of service and to do things right. Just yesterday two women from New Zealand were here. They told Robert that they had traveled all over the country, and the construction here at San Miguel is the best they had seen in Ecuador. 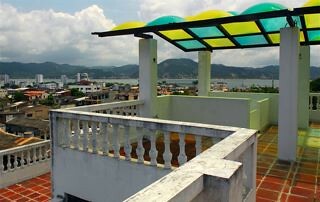 Unfortunately, even the Ecuadorian builders who are honest often have no idea of Western standards. Safety appears to be more important in troubled times…but really finding safety with the banks, the people and currencies you deal with is ALWAYS important. This is why multi currency safety is as important as bank safety. Investors who do not have multi currency diversification can end up holding assets in a safe bank but with a worthless currency. Do not miss tomorrow’s message as it reviews my multi currency diversification now. Join Merri, me and Jyske Global Asset Management at one of our courses. We review economic conditions, Ecuador real estate, my entire portfolio and natural awakenings to health and wealth with investing and business ideas for the months ahead. 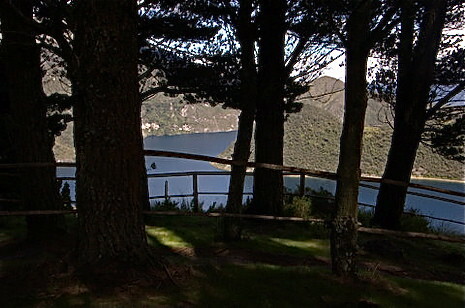 We’ll look at potential of real estate for sale on this lake. 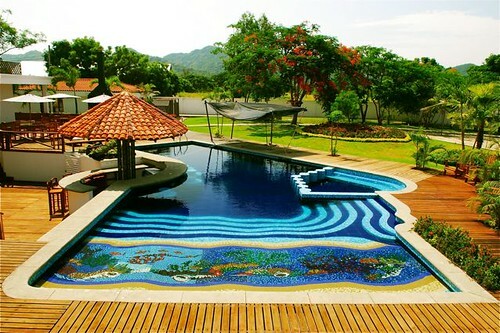 and the value of Ecuador homes at San Miguel and Prima Vera II. 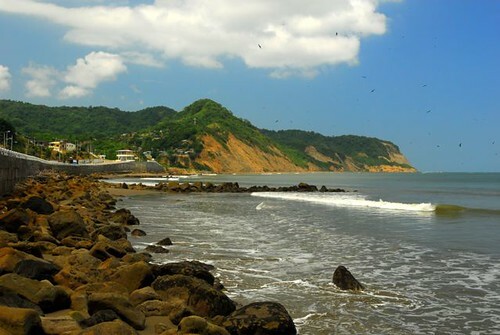 We’ll review review potential on Ecuador’s coast. Join me with the staff of Jyske Global Asset Mangement in Naples Florida to learn more about where in the world to invest now. Learn how to attend this course free and save $499 to $750. Until next message good global investing! Get our web based course FREE if you join us in Ecuador. Learn more here. 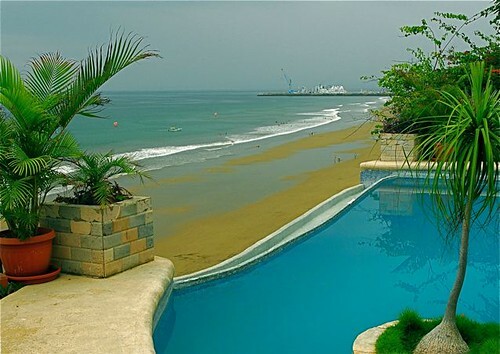 Ecuador living offers many benefits, one being that it stimulates the sluggish Ecuadorian economy. However, all of human existence is one of polarity. Black must have white, positive needs negative and money always brings a rising price. 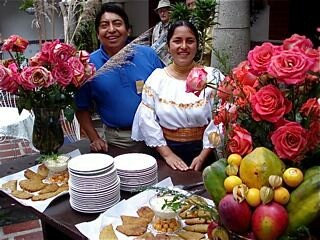 Take Eduardo and Consuelo, who work at our Ecuador Hotel El Meson de las Flores. 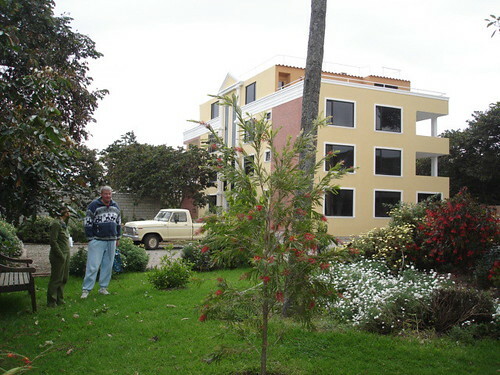 The hotel was in receivership and empty when our foundation Land of the Sun bought it to help stimulate the economy in this part of the Ecuador countryside. By bringing people we have helped save their jobs. This has been a never ending story since the beginning of time..everywhere, neighborhood to neighborhood, city to city, county to county and country to country. 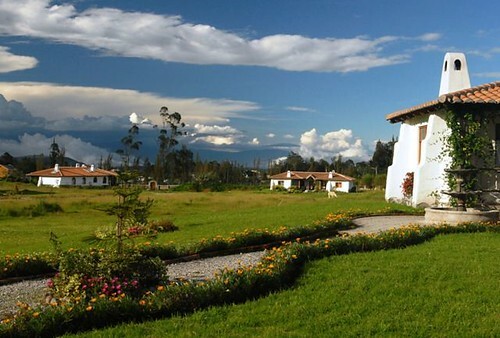 So far the majority of Ecuadorians love us….as much or more as our neighbors here in North Carolina’s Blue Ridge mountains. 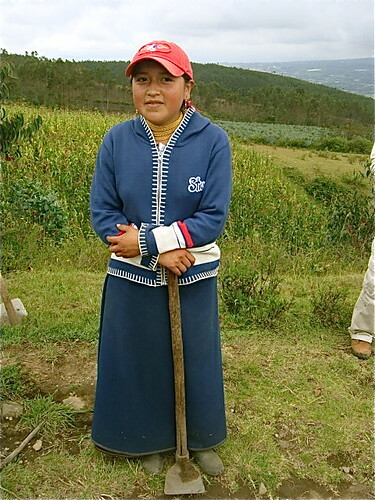 Most Ecuadorians cannot afford property because the locals were pushed out of the market by the Spanish about 500 years ago…just as American natives in the US were pushed out by the English, Germans, Irish, Scots, Italians, Chinese and others who arrived here. 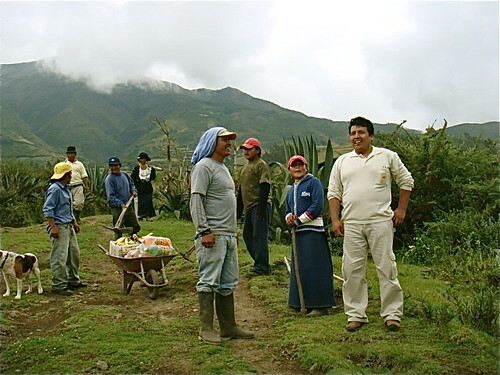 Our arrival in Ecuador creates jobs, hope and a chance that many more Ecuadorians will be able to own their own land. However the problem goes beyond just a few investors arriving from the US, Canada, Span, Italy and many from Colombia and Peru. This is a time of transition for Ecuador with the final phase of the colonial hierarchal system near its end. Whether the locals in Ecuador like it or not…just as people in many other countries do not like it, we all live in a global economy. Many Americans did not like selling so much property to the Japanese in the 1980s. They will gripe now as Europeans buy big chunks of Florida. The Floridians will gripe. Yet they will sell, take the money and move to North Carolina…where the North Carolinians will gripe about the inflow of Floridians. Prices will equalize anywhere there is a distortion, locally…nationally or globally. Water gushes down. Air rushes into vacuums. Money flows towards good value. We see this in the United States with gas prices rising to $4 a gallon. This is not as bad as in Europe where gas runs $7 or $8 a gallon….but it is still a shock to those of us who can remember…(yes it’s true) gas at 19.9 cents a gallon. Gas is a global commodity. Americans have to pay the going rate. 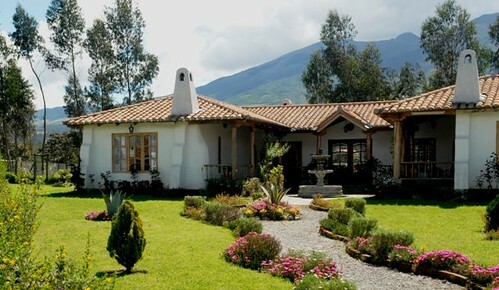 Ecuador property is a global commodity…in an ever growing global economy. I am a full blooded American…born and raised in the USA…as you can get. Today, I am wearing all American clothes beginning with my American Converse tennis shoes (made in China), my American Wrangler jeans (made in Mexico), my American Fruit of the Loom underwear (made in El Salvador) and my American Van Heusen shirt (made in Bangladesh). So even if I stayed in America, unless I plan on running around shoeless and naked, I will encroach on people in other countries…pushing up property prices for factories…that create jobs…help feed families…and create pollution. Positive…negative…positive…this never ends. My first book “Passport to International Profit” was published in the early 1970s and included a chapter on “border blindness.” This chapter looked at how political borders are illusions that support hidden agendas for the few who encourage them. Borders are transcended by almost all human emotions. Get a pretty Italian and handsome Irishman together and they will fall in love. Put a Mexican with a cheaper tomato next to a hungry Canadian and the Canadian will get out his loonies and buy the tomato. Put an Englishman and Frenchman in a sinking ship and they will both bail water. The market place of humanity tramples borders. The deepest nature of our existence supports free trade and free movement of all to anywhere in the world. Since that book was written…modern communications and transportation have made all of this even more true. For example at Cotacachi communications see how broadband has changed the way we can live in Cotacachi. We are, at the deepest level of our being, all citizens of the world. It is logical and correct that we trade with those who serve us best…whether they bring products to us (like the tomatoes, shirts, shoes, pants and even underwear) or we go to the product (real estate abroad). I have found that if one treats people with fairness and respect, these courtesies will be returned. This was as true when we moved from Florida to Ashe County, North Carolina…where Floridians are called “Floridiots” by many locals…because they pay too much for the land and drive prices beyond the local abilities. 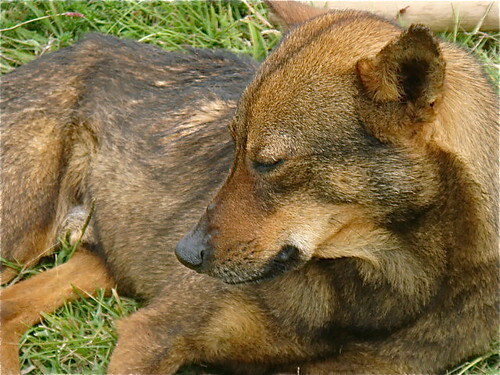 I know we are loved by our friends and staff in Ecuador. 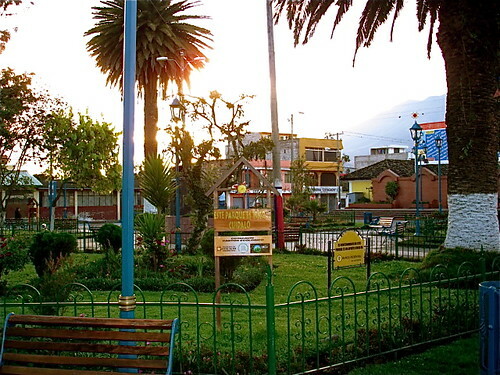 Cotacachi Ecuador Hospitality shows how they treated Merri on Mother’s Day. We are loved up here in North Carolina as well…not because we are Americans or Floridians or because we are red, white or black, Christians, Muslims or Jews, but because of how we act with our friends, neighbors and business associates. When you treat people right…you become known as a friend not a nationality. We are loved because we try to treat people with care, respect and fairness. We bring in money and bring them work. Few economies, local or national can isolate themselves from the global economy and enjoy a high material standard of living. Ask the people of Mynmar if you do not believe this. mankind to eliminate all borders, customs, immigrations and nationalities for a decade. My bet is we would never go back. 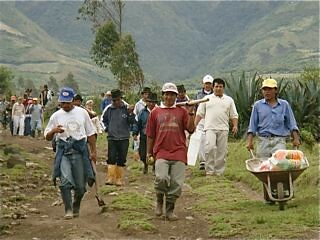 In Ecuador I do not see a resentment problem…but let’s allow the people of Ecuador have ther say. A leaflet has been posted on buildings and telephone poles all around San Clemente, the small village where Merri and I have bought our beach condos. This was not put up by us..nor by the developer of the condo where we are buying. This was written by locals in San Clemente. 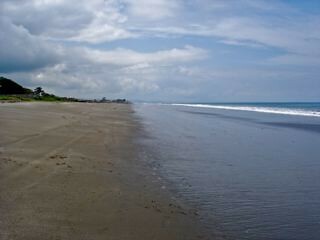 I asked John Papski, our man on Ecuador’s beach, to translate it. 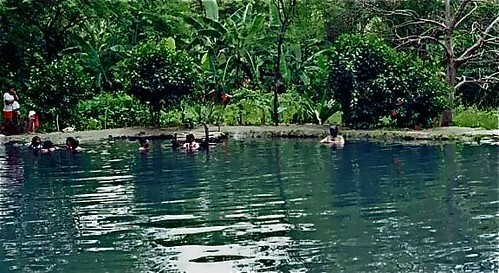 Here is what the Ecuadorians are saying about our arrival in their small fishing village with a five star spa hotel and a 61 unit luxury condo development that will change the village’s life forever. 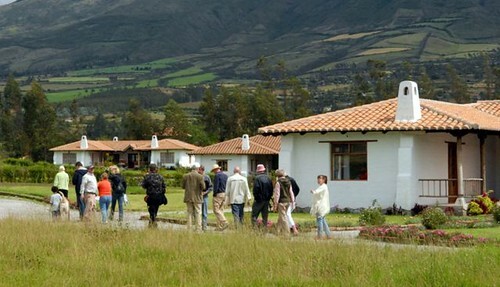 “Ecuador has a population of 13 million (2008 )and 3 million that live abroad (23% ). Parents have immigrated leaving their children; people left for lack of work, pessimistic views of the future without opportunities, corruption, globalization and neo-liberalist practices have contributed to a disappearance of opportunity for individual, family and social development. “San Clemente has an approximate population of 4500. There is a need for 600 new jobs per year for the youth but nature and the sea does not allow sufficient funds for welfare, health and studies. 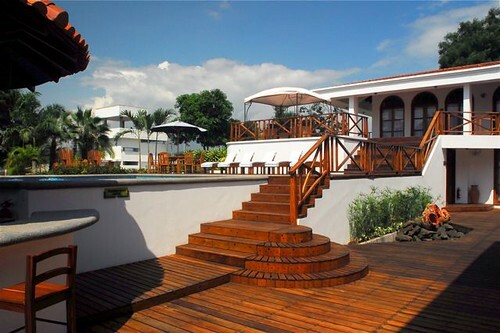 “However, tourism is one of the few chances left for Ecuador and its youth. “The marvelous beaches of San Clemente attract people that travel many hours, save and borrow money so they and their families can spend on food, lodging, water, beer, sun lotions, repellents, handcrafts and return home broke but content knowing that health, welfare, lust for life, relaxed has prepared them to continue the hard fight in the city.They have integrated with nature with the immense help of the sea and its marvelous sounds and movements, with the wonder of the beach and hills that surround, wonder of tranquil people, amiable and service orientated to all visitors with humanity, smiles,assistance and hospitality. “Our visitors dream during their happy stay of a swift return to our beach or perhaps remain here forever. 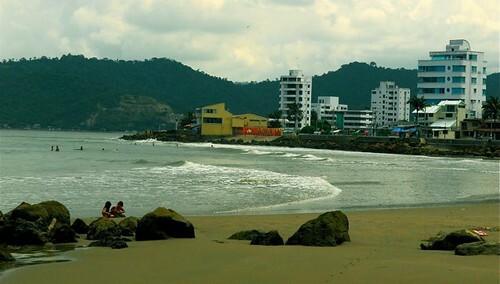 The beach tourists do not come to Rocafuerte or Charapoto (nearby towns ). They come to San Clemente. There you have it, a local view of what they think of us. So far I believe we are more than welcome. I hope that Merri and I and all we bring along have the wisdom to be with the wonderful people of Ecuador in a way so they are not just happy that we come…but that they also want us to stay. 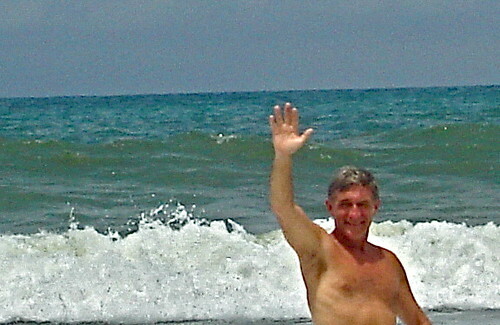 I invite you to join us in the wonderful adventure and as human beings who are citizens of the world! 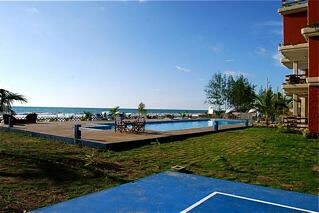 Pool, tennis court and beach at Palmazul where we stay on our coastal tours. 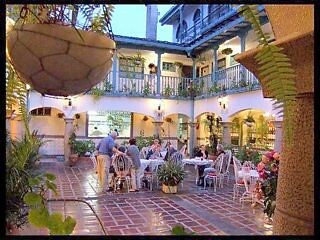 Courtyard at Ecuador hotel El Meson de las Flores where we conduct our Spanish Courses, Imbabura Real Estate Tours, Shamanic Mingos and Import Export tours.